I recently received my new Republic of Tea catalog in the mail. Great fun to look at. 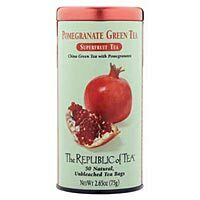 Inside was also a sample of this Pomegranate Green Tea. The package was beautiful, a shiny red foil envelope which inside held the teapod. I decided to make it as an iced tea for on my long drive to work. It was really refreshing and had great flavor in this extreme heat we are having right now! Light violet in color the tea had a grape flavor to it. Not sure it really tasted like pomegranate or green tea to me, but I enjoyed it nonetheless. Hmm Purple?! I might have to give it a try! One of my favorite teas is Persimmon white tea by Republic of Tea !